Japanese Edo Period Wood Carving of a Monkey on a Peach Tree. Originally housed in a Buddhist temple. 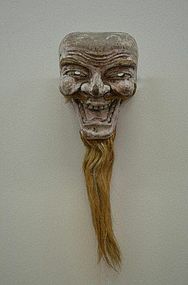 Carved of poloma wood. 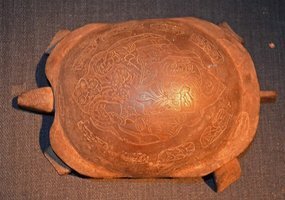 Original pigments still exist, which is very unusual for the age. It is a wonderfully carved and captivating work of art. 23 x 9 inches, 58.5 x 23 cm. Japanese Bronze Incense Burner of a Monkey. A wonderful stylized casting of a hanging monkey. A special work of art. 10.5 inches, 26.5 cm. 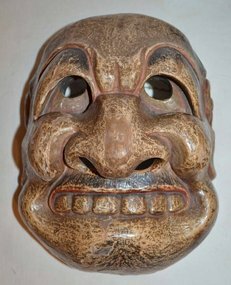 Finely Carved Wood Iki Mask with Japanese Collection Label on Back. A wonderful example featuring a dynamic human presence. Detailed with glass eyes and human hair, and a burnished gofun lacquer finish. 6.25 x 6 inches, 16 x 15 cm. 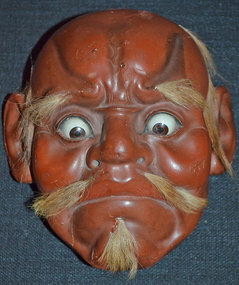 Finely Carved Wood Iki Mask with Japanese Collection Label on Back. A wonderful example featuring a dynamic human presence. Detailed with glass eyes and human hair, and a burnished gofun lacquer finish. 6.25 x 5 inches, 16 x 12.75 cm. 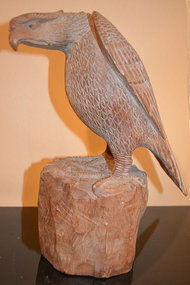 Beautifully Carved, Large Japanese Boxwood Okimono of a Perched Hawk. 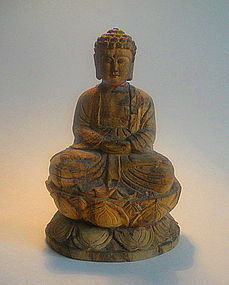 Finely carved with naturalistic rendering. Signed by Miyamori. Height: 11 inches, 28 cm. 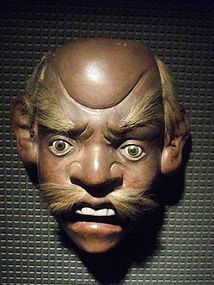 Rare and wonderful Kyogen Theater mask dating from the Edo period, the golden age of Noh Drama. Kyogen are short, humorous skits performed between Noh acts to lighten the mood. 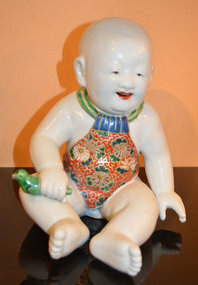 He has gold eyes with a rich red lacquer finish. Red represents both drunkenness and healing. The large nose gives a striking sense of comic drama. 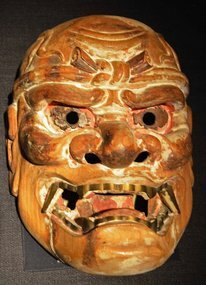 This fine mask is brilliantly carved, accentuating the depth of the mask, and adding a sense of comic theater. 8.25 by 6.5 inches, 21 x 16.5 cm. 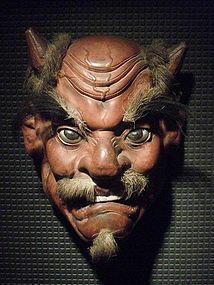 Very rare Japanese comic demon Buaku Kyogen mask dating from the Edo Period, the golden age of Noh Drama. 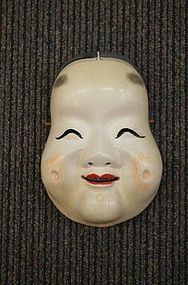 The Buaku mask is a Kyogen version of the Noh Beshimi. Kyogen were short, humorous skits performed between Noh acts to lighten the mood. 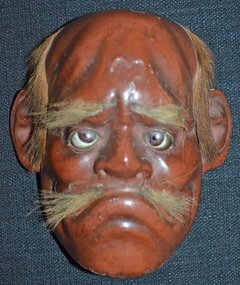 The heavily knit brows and wide leering grimace are wonderful characteristics of this mask. 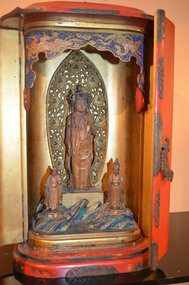 It is covered in layered colored gofun (oyster shell lacquer), with hair painted with thin lines of ink over the top. 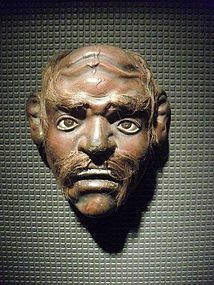 It is brilliantly carved, accentuating the depth of his eye sockets, and adding a sense of drama. 8.25 x 6.5 inches, 21 x 16.5 cm. 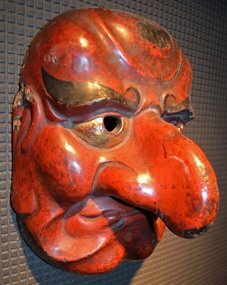 One of a collection of three fantastic and rare, large Edo Period Iki masks, de-accessioned from the Musée Archéologique in Strasbourg, France during the mid-20th Century. These three are rare for their large size. They have never before been offered on the art market. The other two masks are posted on this site. Carved Poloma wood with gofun (oyster shell lacquer), glass eyes and human hair. 7.5 inches (19 cm) high x 7 inches (18 cm) wide. One of a collection of three fantastic and rare, large Edo Period Iki masks, de-accessioned from the Musée Archéologique in Strasbourg, France during the mid-20th Century. These three are rare for their large size. They have never before been offered on the art market. The other two masks are posted on this site. Carved Poloma wood with gofun (oyster shell lacquer), glass eyes and human hair. 9 inches (23 cm) high x 8 inches (20 cm) wide.